All of us have thought about time travel at one point or another. Whether it was thinking about where you'd like to go, or how fun it would be, it's definitely crossed each of our minds. A lot of our obsession with time travel is no doubt caused by the popularity of Back to the Future, and how much fun it looks like it would be. Sure, Marty McFly ran into a few issues here and there, but it all worked out in the end! 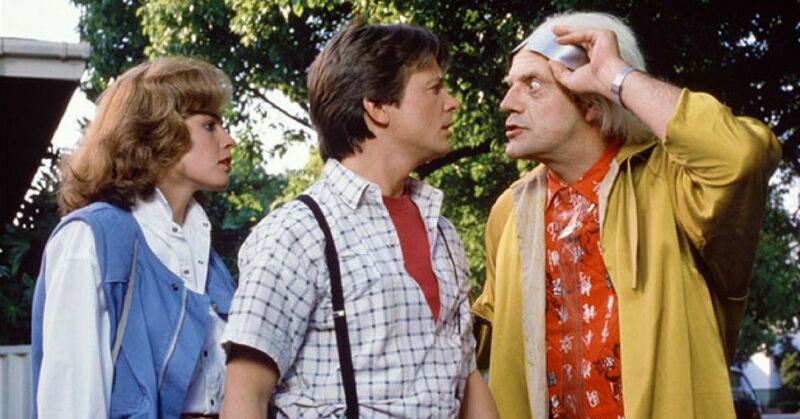 The movie (and its two sequels) made us believe that anything was possible as long as you befriended a genius with a Delorean. Last weekend there was a fan expo in Boston, and lucky for us, a bunch of the iconic actors from the movie showed up. Michael J. Fox was there, which makes sense because no Back to the Future event is really complete without him, but he was joined by Christopher Lloyd (Doc Brown), Leah Thompson (Lorraine Baines-McFly), and Thomas Wilson (Biff Tannen). The cast posed for pictures together at the event, and shared them on their Instagram accounts, and even though it has been 33 years since the first movie came out, everyone was still thrilled to see them. It seems like they've all made up with Biff. Recently Thompson spoke to Closer Weekly about Fox, revealing that they spent a lot of time together on set. "He’s so funny, clever, and self-deprecating, yet strong. If you want an old memory... I didn’t realize he was a star then," she said. "We shared a little trailer [on set], and we couldn’t get out because these neighborhood girls [trapped us inside]. I was like, 'I guess he really is famous!'" Lately the cast has been asked a lot about whether or not they would be interested in doing a sequel, but Lloyd had a lot to say about it. He said he would only do it if it was "the right idea". “I’d be delighted. I'd love to be in a fourth film, if they could come up with the right idea that extends the story and does it as well as the first three," he said. But the writers don't seem interested in that idea. They've said before that as long as they are alive, they will do everything in their power to prevent a reboot from happening. "Yeah, as long as I have my say [it's safe]. That one exists just like ET - we're never touching those," Frank Marshall said. They still have a lot of love for the movie after all this time. While Thompson joked about her character's storyline, she continued by explaining how powerful the message actually is. The movie will always be one of the best of the best, and I think we can all agree that every time we see them all together we will all be so thrilled.